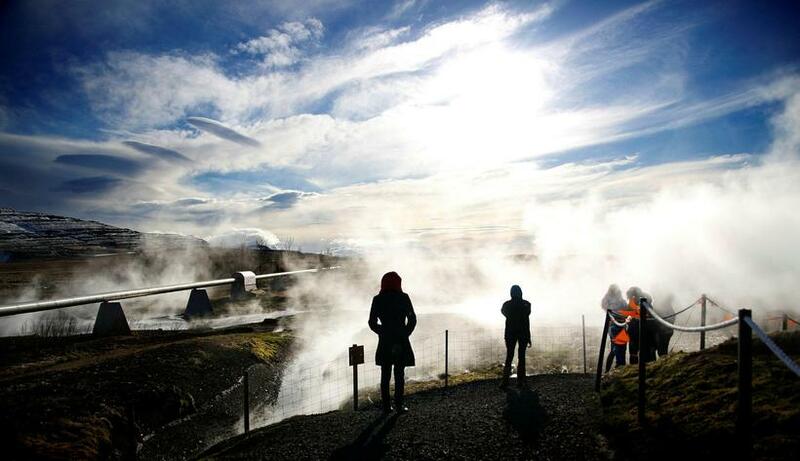 West Iceland might sound like a faraway place when you are in Reykjavík, but a in a single day tour from the city you can see most of what this beautiful area has to offer. Borgarfjörður is renowned for beauty. Mostly covered in old, rough lava, with rivers and streams running in between, creating some of the most stunning waterfalls in Iceland. This is an area Icelanders have spent weekends and summers for decades, and as you can see there are plenty of summerhouses in the area. To make sure you have plenty of time, starting off early from Reykjavik is a good idea. To be able to see everything, starting off around 8 in the morning would suit fine. Start with taking the nr.1 ring road and drive on, through Hvalfjarðargöng tunnel and towards Borgarnes, the biggest town in Borgarfjörður. When you have the town in sight, take a moment to admire Hafnarfjall, the great mountain on your right. It’s beautiful in its own way and different from most Icelandic mountains, like a giant pile of sand with cliffs standing up from it. This is one of the windiest places in Iceland, note how none of the trees around grow straight up, they all lean a bit due to the wind. Keeping on, you don’t enter the town or cross the long bridge in front of you, you take a left and drive on inland. The most powerful hot spring in Europe is located just by the road. The water of Deildartunguhver hot spring pumps up 180 litres per second of literally boiling hot water. It has been used by locals for centuries to cook their food and clean, and recently to warm up the houses in the area and surrounding towns. Even though the water is harvested so much, you can stop by and see much of it bubbling and streaming out. The only problem is that if you want to take pictures of it, there is quite a lot of steam! 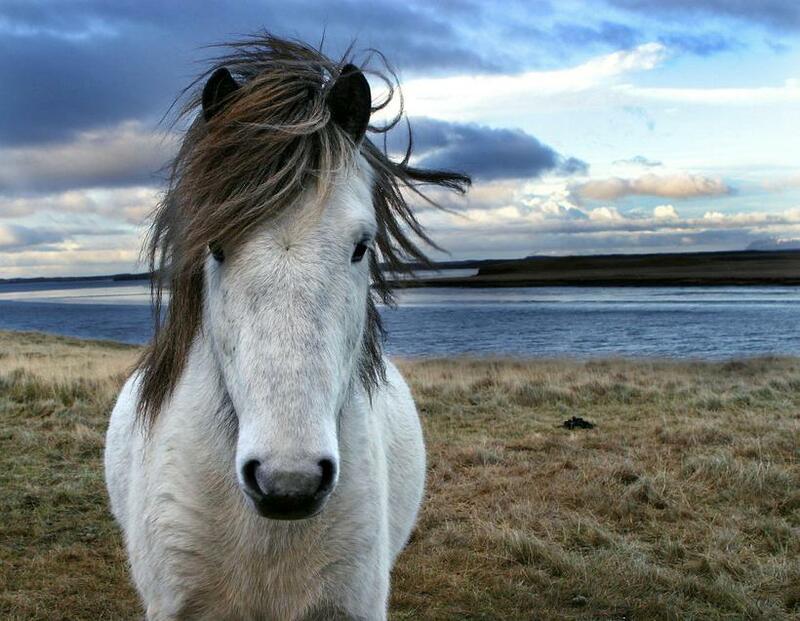 For a quick stop for Icelandic horses, stop by at Sturlu Reykir, which will open this summer. The local horse farmers have opened the farm for visits, where you can meet some of their horses, pet them and take pictures. In this local’s humble opinion, Hraunfossar is one of the most beautiful waterfall in Iceland. It’s not great or powerful, but it’s unique and absolutely beautiful. It doesn’t come from a visible stream or a river, it comes from under the lava field and falls down into Hvítá river. It’s surrounded by green vegetation that turns into a spectacular yellow-red-green painting in autumn. A two minutes hike or so North of Hraunfossar there’s Barnafoss. A very different sort of waterfall. Barnafoss is in Hvítá itself, which is a milky white and relatively big glacier river. The waterfall is loud and powerful, and hammers on the rocks of the canyon it runs through. The name, Barnafoss (English: children’s waterfall), refers to a folktale. Two children were walking over a stone arch over the waterfall, which serviced as a bridge in those days. They fell into the river and drowned. Their mother was so furious that she had the arch broken down. 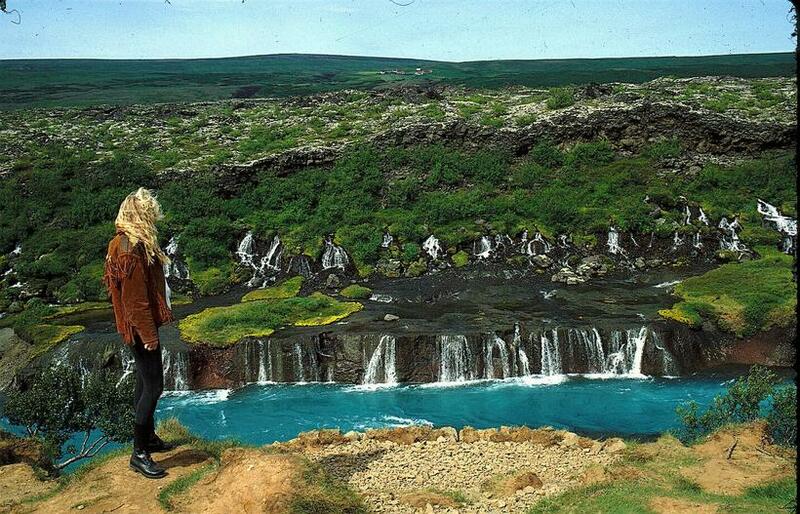 Húsafell is known for great weather and has been a popular destination for Icelanders on summer holidays for decades. In summer, the highest temperatures are often recorded at Húsafell, sheltered from winds by mountains and Langjökull glacier looming over. There is a pool, a small shop, and a beautiful four star hotel with a great restaurant called Hótel Húsafell. Even though the hotel is relatively big, it doesn’t appear so. It fits in the environment perfectly. 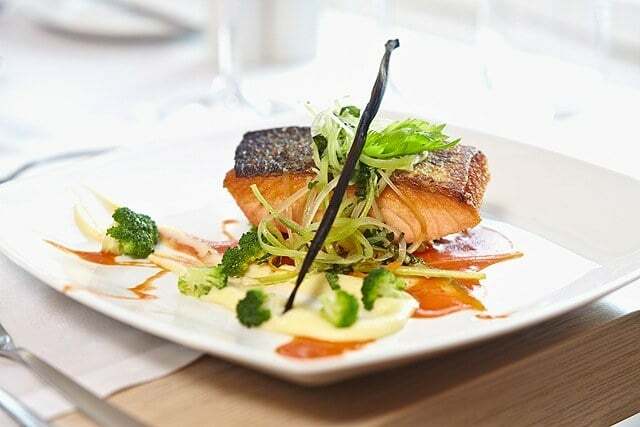 The design is modern and elegant, and the restaurant is one among the best in Iceland. All in all, it’s a perfect stop for lunch. It doesn’t hurt that though this restaurant is so fancy, the price of the lunch menu is very reasonable. There are two very different and amazing things to do in the area. 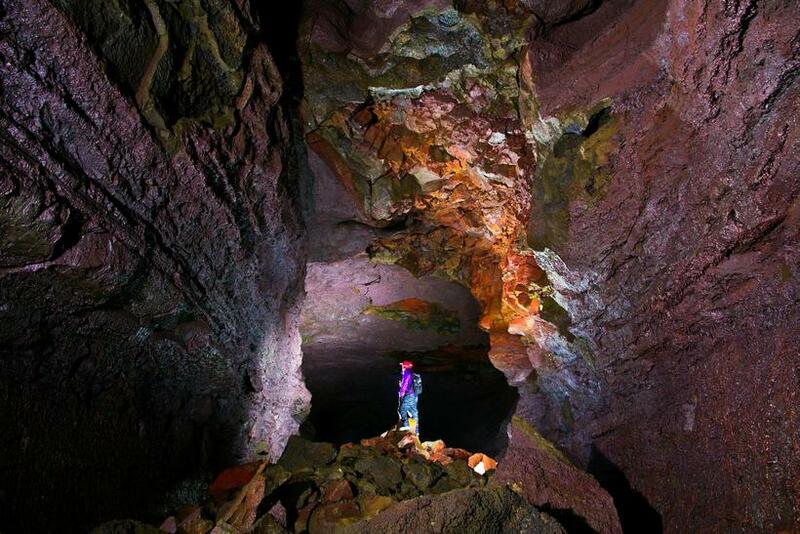 See the greatest lava cave in Iceland, or visit the inside of a glacier. Sorry to say you won’t manage to do both in a day trip. The lava cave was formed just over 1000 years ago. It was closed off for a long time, which means all the beautiful lava formations are untouched and unspoilt. In the tour you hike just under 700 m inside the cave, on a platform to protect it. The hike is easy and the tour is family friendly. Surrounding you are a stunning area of colours, different lava formations (some of which look like melting chocolate), and if you come in winter, ice formations. It’s truly an amazing experience, Víðgelmir is a cave like no other. A very different sort of “cave” exploring. 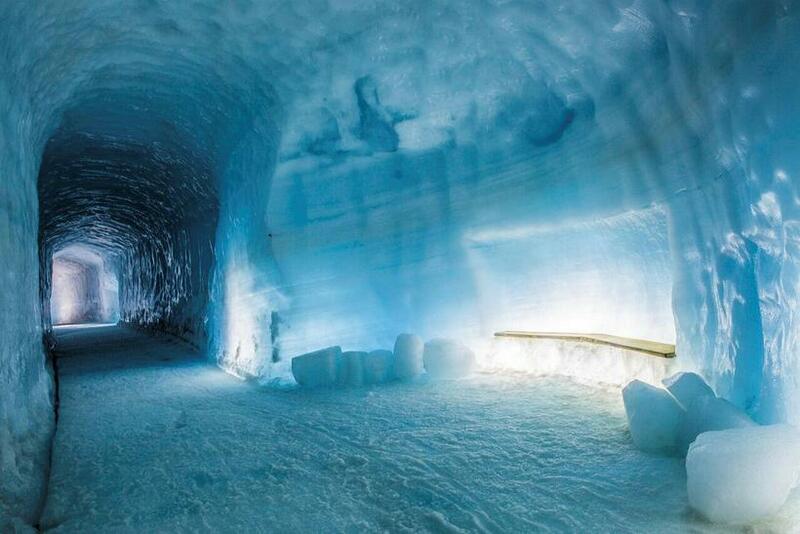 It’s a manmade ice cave in Langjökull, Iceland’s second largest glacier, created a few years back. The ice cave is 800 m long and reaches 30m into the glacier, lit up for you to see the array of blue and white glacier colours. It’s without a doubt one of the most popular tourist attractions in the area. For something completely different, a visit to Geitafjársetrið á Háafelli. 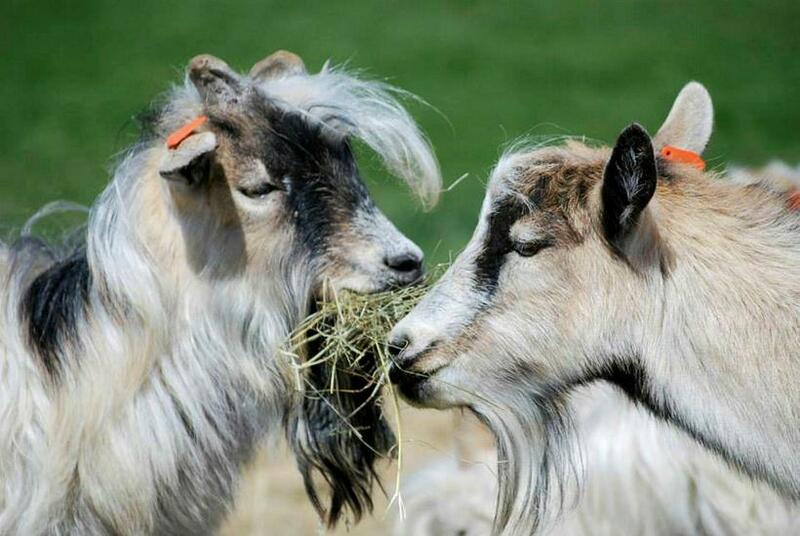 It’s a farm that specializes in preserving the Icelandic goat, which is an endangered species. The goat has been a part of Icelandic agriculture for decades but was almost extinct in the last century, as sheep are considered to be more practical. And at Geitafjársetrið á Háafelli, you can meet them and even pet them. Geitafjársetrið is like any other farm, and the goats are a part of it. Which means you can buy the local goat cheese, goat sausages, goat meat and hides, as well as soaps and creams made from the goat fat. In addition to that the farmer makes jams, syrups and more from her garden and sells there as well. It’s open in summer from 13-18, if you’re going by in winter you might be able to visits have to be arranged in advance. Further information here. The road in Borgafjörður goes in a circle, so instead of going the same way back (where’s the fun in that?) keep on the road by Geitfjárssetrið and keep stick to that until you get to the nr.1 ring road, then you turn south, to Borgarnes/Reykjavik. When you are closing in on Borgarnes, you’ll see a big sign that says Hótel Hamar. It’s a lovely hotel, but what is more important in this instance, the restaurant is great. The décor is a modern, Nordic style, very clean. The menu is simple, Icelandic ingredients prepared in a modern way. The outcome is very delicious. This road takes you through Borgarnes. 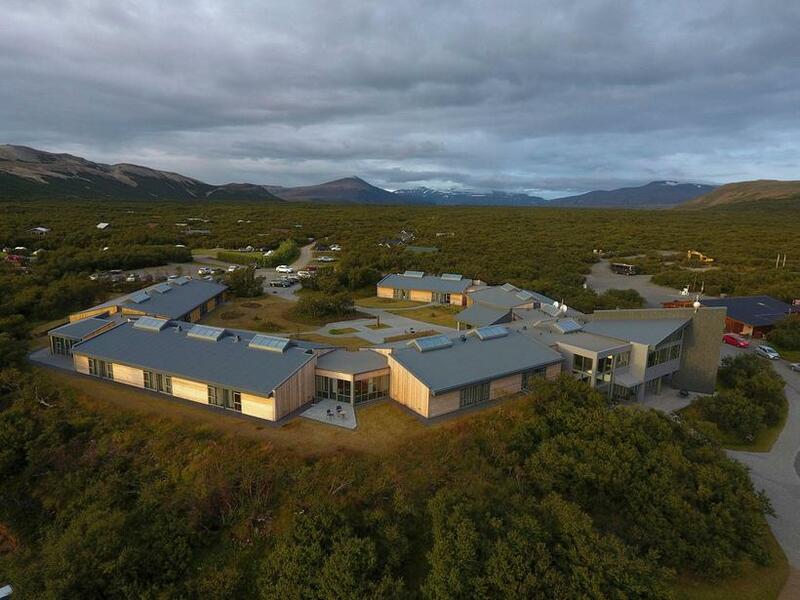 If you still have something left in you after a full day of sightseeing, a stop at The Settlement Center in Borgarnes is a great way to get to know Icelandic history and culture through the Icelandic sagas from the area. Though museum visits after dinner are not a common thing, perhaps they should be? The museum is open until 9pm and it’s perfect to relax, learn and admire at the museum after a good meal. There is also a restaurant there, if you want to skip Hótel Hamar and strike dinner and museum with one stone, so to speak. The drive back from Borgarnes to Reykjavik is around 1 hour. We are talking about a day tour that will take all day to finish. But it’s so packed with different, interesting things that when you think back, you’ll feel it was an experience that took days!